This is a custom overlay I created to stick over the face of my MicroKorg. I found it really hard to use the MicroKorg, because it's so difficult to read the lines of controls under each knob, in relation to where you had each Edit Select knob positioned. It did my head in! Korg should have at least drawn lines for each row to help the ol' eye-balls. Or even better, color coded the different rows in some way. On my overlay, I've also added some basic notes about settings that aren't clear from the readout, such as listing the wave types available for that function. This makes the information a bit more accessible without having to get the manual. Personally, I think my overlay makes things much easier and more intuitive, and therefore more fun and playful! 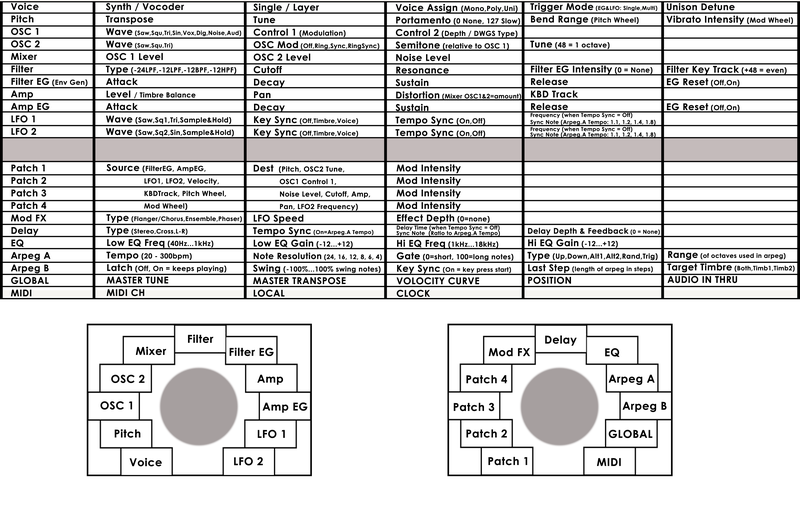 I'd like to know if anyone else struggles with the MicroKorg interface, and if this helps them. I've color coded mine (with pencil, after printing it out!) so you can see which knob settings correlate to which row of functions. That was the main goal for me! In the process of making it I also read the manual more thoroughly, which helped bring everything into focus! Hooray. 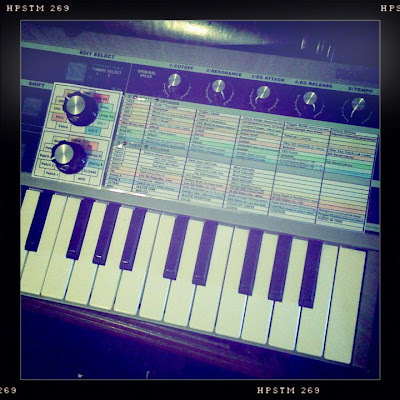 Download the fullsize MicroKorg Customface overlay and print it out for yourself! You'll have to figure out how to print it the right size. It should fit perfectly if you get it right! Print it in landscape on A4 and see how you go. You'll have to color it in yourself, too! I was going to color it in Photoshop, but I only have a black and white printer at home, so I just colored it myself with pencils. I used the same color family for related sections (all LFOs are blue, OSCs are warm colors, ARPEGs are purpley colors), and left a few sections white to keep it from getting muddy with colors (the Patch section, GLOBAL, MIDI, and Voice). To stick the overlays over the dials, just cut each one out separately, then cut straight up from the bottom-middle with scissors, then cut away the grey circle. Voila! Now just slide it down behind the knobs and sticky tape it all into place. 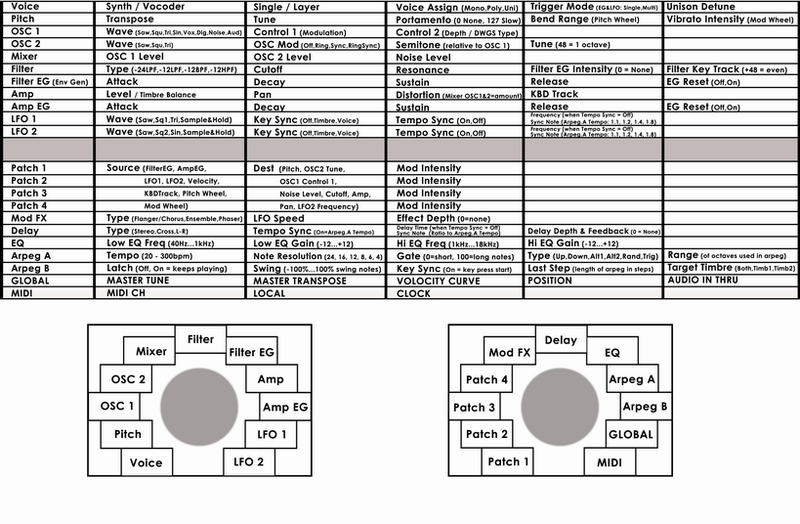 I'm planning on doing a video on how to control the parametres of your MicroKontrol with a Behringer BCR2000 soon. This means that you can easily tweak 32 parametres at once, instead of just 5! 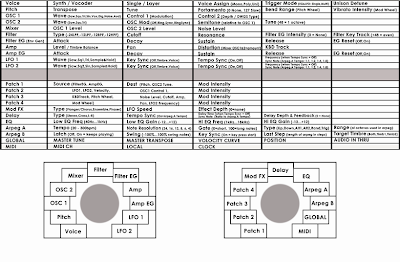 You can find my post about setting up your BCR2000 to control the many parameters of your MicroKorg here! This overlay is a great idea! I haven't received my Microkorg yet, but it is on its way. This should help immensely. Cheers Anonymous, yeah, I found their interface really hard to use. It's hard for the eye to "grab onto" the different rows and columns, and match them to the knobs. All the best! And have fun MicroKorging!